Watch Me Help A Medical Doctor (Endocrinologist) Walk Again In Only 5 Days When I Overcome All The Causes Of Her MS Symptoms, Including A Lumbar Spinal Curve. My first video on this page is of a medical doctor who invited me to go to Sao Paulo in Brazil to help her overcome the multiple sclerosis symptoms she developed, because she lost her faith in the medical beliefs about what causes multiple sclerosis and one of the first things she told me, was that she always had a very stiff sore neck, and suffered stomach pains. — In fact, Dr. Barbara Bisilli had such stiff muscles throughout her whole body, she nearly fell over every time she tried to take a step forward, because her whole body was rigid like a board, as you will see in this video below. Dr. Bisilli’s excess muscle sclerosis (stiffness), was among the worst I had ever seen. Her next stage of symptom progression would have been for her legs to have been stiff for so long that they end up failing on her and become “Rubber-like Useless”. Watch Dr. Bisilli walk across the room on Day 3, and improve a little on each walk, after I overcame Irritable Bowel problems she had, and taught her how to use her mind, to overcome “Negative Muscle Memory” which is one of the most difficult causal problem to overcome, and also the reason why patients get improvement that soon goes away. SYMPTOMS: – Tremors, Muscle cramps in her lower back, legs and stomach, Extreme loss of balance, Numbness and tingling sensations in her muscles, Incontinence, Difficulty lifting her right leg to walk. In the hundreds of assessments I have done on MS patients I have found all of them to suffer from a sore neck and one-sided muscle rigidity, a subluxed C1 vertebra, and a spinal curvature, and I have also found that “MANY” of them have developed polyps in the colon along with digestive problems. — Using iridology (The Bernard Jensen Method), as one of my assessment tests, I have often found colon polyps and signs of Irritable Bowel Syndrome showing in the eyes of my Parkinson and MS patients, and whilst some iris signs are questionable, these two signs are “ALWAYS” correct. I have found this IBS sign so often, I now treat all MS patients for stomach problems because poor digestion and absorption of nutrient is one of the main contributing factors of the extreme muscle rigidity found in patients of multiple sclerosis and Parkinson’s disease. 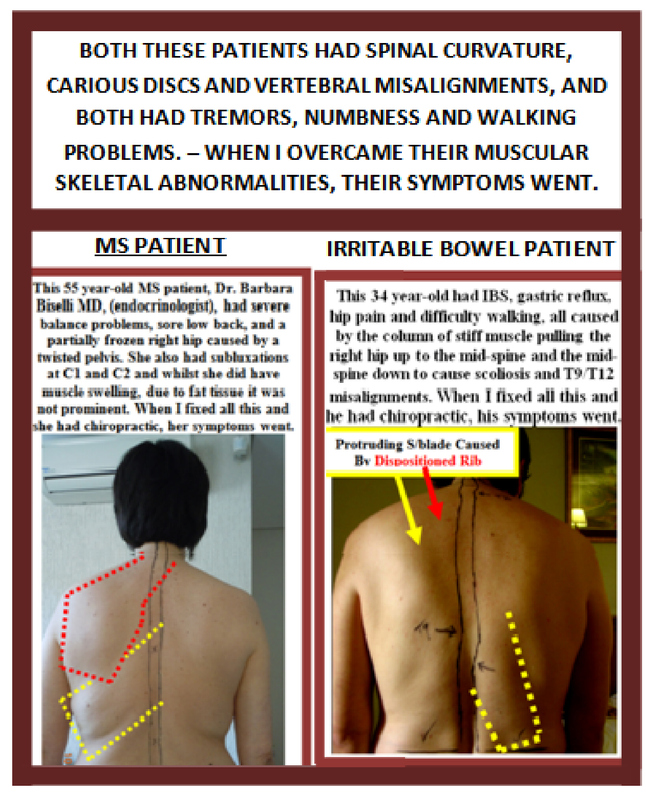 In the two back photos below, of Dr. Bisilli’s back, and the back of a patient diagnosed with Irritable Bowel Syndrome, you can see all 3 of these problems which suggests IBS is also caused by these three causal problems. Most commonly, the very first symptom of multiple sclerosis begins due to excess neck tension making it difficult to turn the head easily, around to maximum (chin to touch each shoulder). — In time, this excess neck tension spreads down the torso to the hips and then into the legs, and symptoms begin to follow its progression in a relative manner, whereupon normal natural therapy ideals will no longer give any significant long-term improvement. — This is when you need to consider coming to me to have me carry out my unique assessment tests so I can design an effective treatment program to cater for “all” your the active causes that are working in your system to create your collection of symptoms. — I learned these advanced “Treatment Secrets” by having to overcome my own rigidity autoimmune suffering in my teenage years which you can read about on my “Noel’s Story” web page. As you can imagine, being a highly qualified natural therapist, Krishna had tried every form of therapy he knew, to try to overcome his symptoms. — Unfortunately, nothing worked to reduce or overcome his symptoms because none of the many courses he studied, while attending several natural therapy colleges, taught him to consider that autoimmune symptoms such as those associated with MS, could be caused by the 3 muscular skeletal problems documented by Dr. James Parkinson. — Krishna had a twisted pelvis and several spinal abnormalities including a spinal curve, that contributed to the cause of his symptoms. Every MS Patient Should Read The Quotes From Dr. Parkinson’s Book “An Essay On The Shaking Palsy” Because Both These Disorders Are Associated With Exactly The Same Symptoms and Both, Have Muscular-skeletal Abnormalities Causing Those Symptoms. KRISHNA’S SYMPTOMS: – Problems with balance and walking to such an extent that he always needed to have a walking frame or crutches when he walked, – Inability lift his knees up very high to walk freely, with it being nearly impossible to lift his right knee, – Drop foot, – Numbness and tingling sensations in her right leg muscles, Incontinence, and intermittent stomach pains. Throughout this website and in some of the “before” and “after” success videos you will see many client X-rays and spinal photos revealing the true causes of the symptoms of Multiple Sclerosis which will give you definite “proof beyond doubt” that myelin degeneration is “NOT” the cause of MS symptoms. — This means you “CAN” overcome the symptoms you are experiencing but you “must” be determined, have faith in your own ability to succeed, and stay focused on getting the success you want. Is it just common sense, that if the symptoms of multiple sclerosis developed because lesions caused the sheath around the nerves of the central nervous system to die off in places, no MS patients would experience any variation in symptom severity, yet they do. — Some MS patients experience extreme variation in symptom severity even from a short afternoon nap. — In this explanation, symptom severity would have to remain constant, because death of parts of the myelin sheath would have no option other than to stay dead. — Portions of the myelin sheath can’t die, then come back to life, then die again etc, according to the extreme symptom variations that some MS patients experience, because once something is dead, it is dead! “Multiple Sclerosis” is a title introduced by a Parkinson specialist Dr. Jean-Martin Charcot in 1877 to describe a number of Parkinson patients he treated who had arm tremors that caused their arms to move in a different direction than the tremors he was used to seeing in most of his regular Parkinson patients. — This lack of difference between these two disorders is why medical doctors to this day, often have difficulty making a decision as to whether a patient has Parkinson’s disease or multiple sclerosis, and why one doctor can give a diagnosis of Parkinson’s disease and another can give a diagnosis of multiple sclerosis. Arm Tremors Moving The Arm In A Different Manner, Gives No Reason To Invent A New Disease, Other Than To Dispense Another Group Of Drugs. Whilst this is an extremely poor excuse to discover a new disease, which is what the drug companies wanted doctors to do in those days, the reason he used the words “Multiple Sclerosis” was not a poor excuse but more of a perfect description, as the word “sclerosis” means “abnormal hardening” and both Parkinson and MS patients suffer from extreme hardening of muscles. You do feel that slight rigid feeling from time to time, right? This is why advanced PD and MS patients both walk with a stiff robotic walk. — This stiffness, or “sclerosis” in both patients is one of the 3 primary causes that Dr. James Parkinson documented after doing numerous autopsies on deceased Parkinson patients. At Home, NOW! — $48-00USD. If you would like to inquire about coming to me in Australia, or you would like me to find out more about the possibility of me coming to you, anywhere in Australia or the USA, please let me know and I will inform you of my availability.